Enhance your lead management efforts with the Marketo Lead Scoring Success Kit. Learn how to use lead scoring to qualify, prioritize and target your leads. 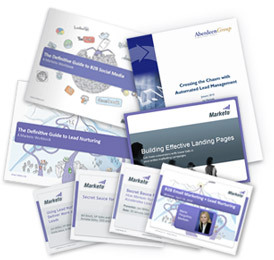 The Marketo Lead Scoring Kit contains helpful resources and best practices including the best ebooks, webinars, white papers, blog posts, videos, and more! Complete the form to access the Lead Scoring Success Kit!